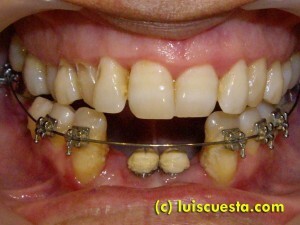 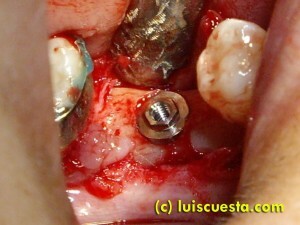 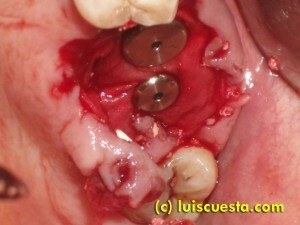 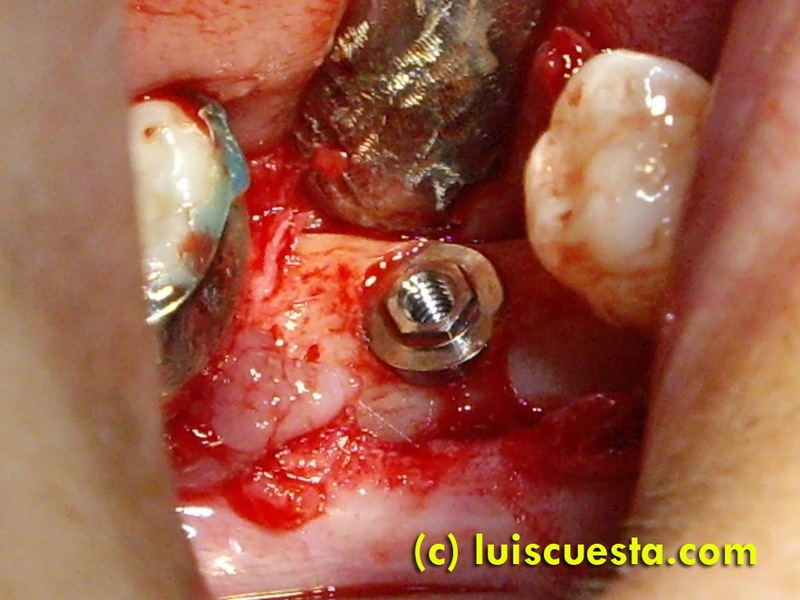 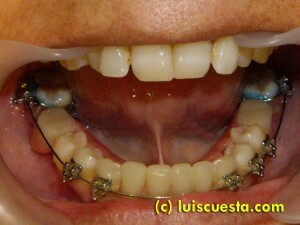 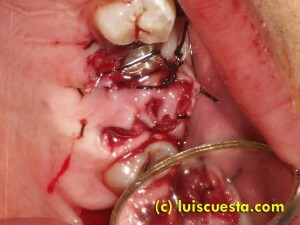 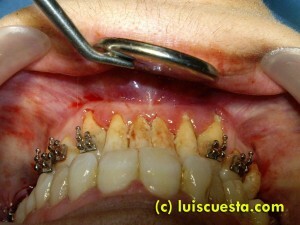 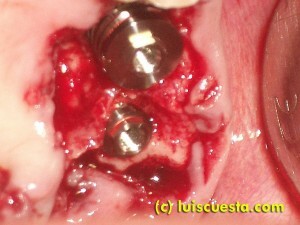 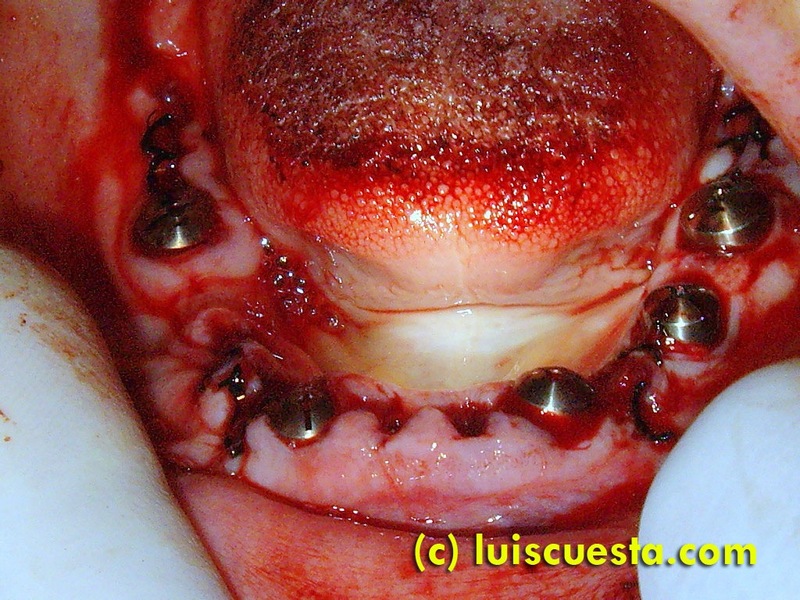 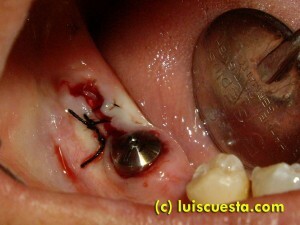 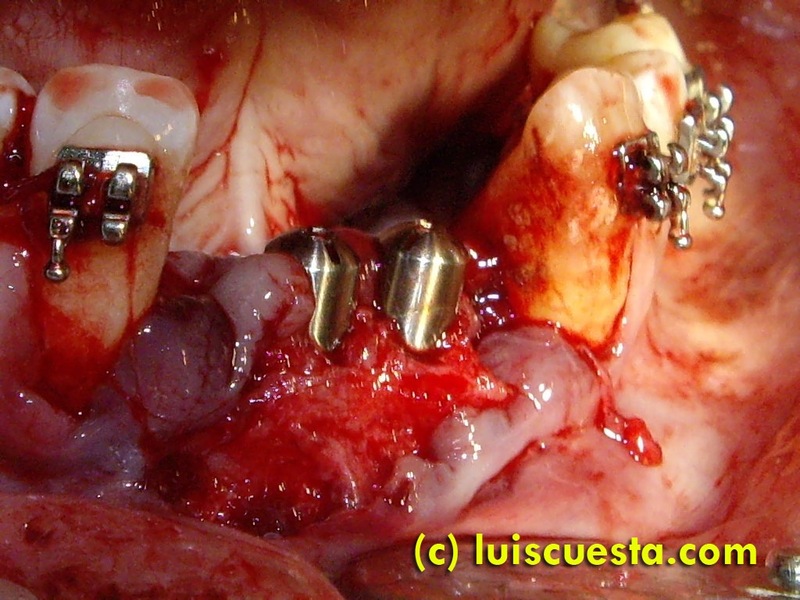 This case shows the placement of several implants, immediately after extractions. Establishing the setup for a following othodontic treatment consisting of maxillary front teeth retrusion. The patient is a severe bruxist. You can tell bi the extremely closed goniac mandible angle, wide jaw branches and high bone density. 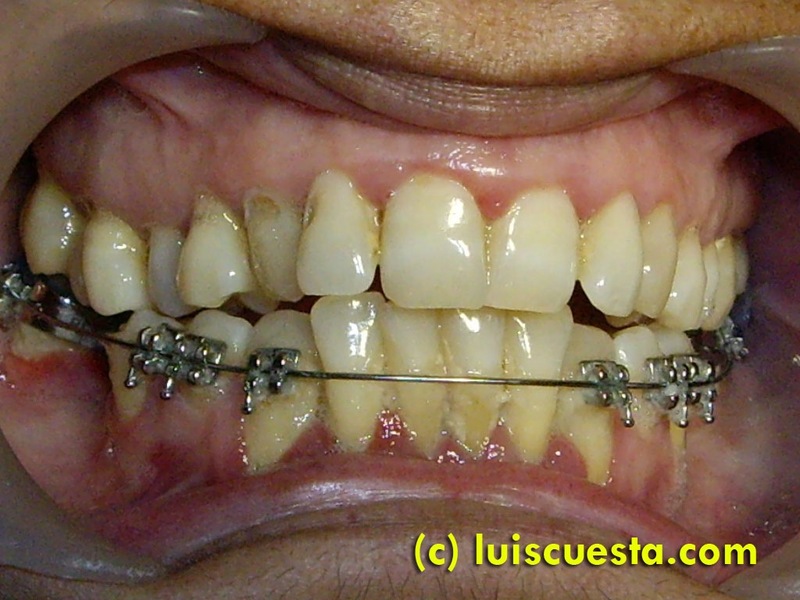 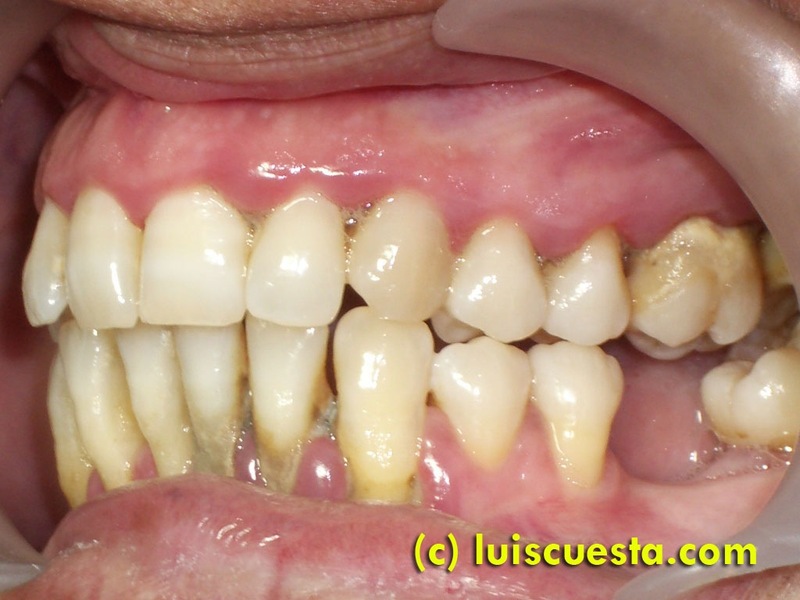 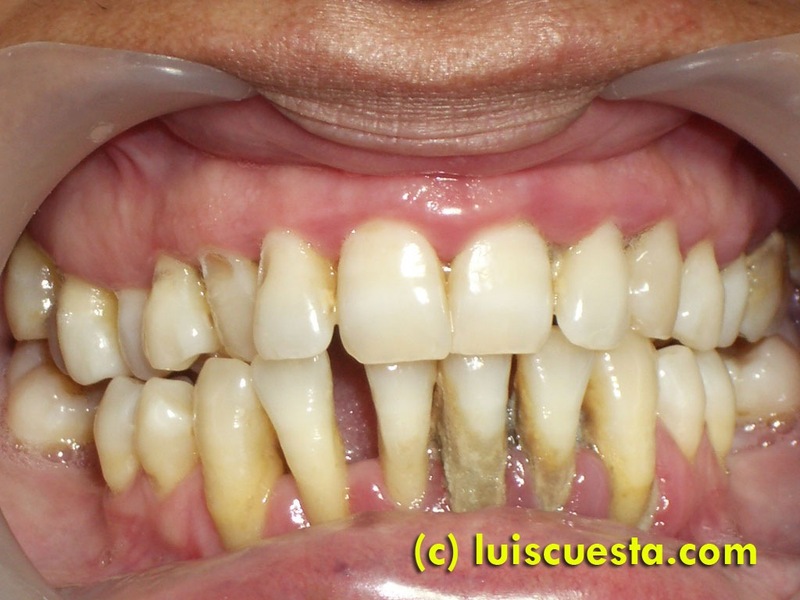 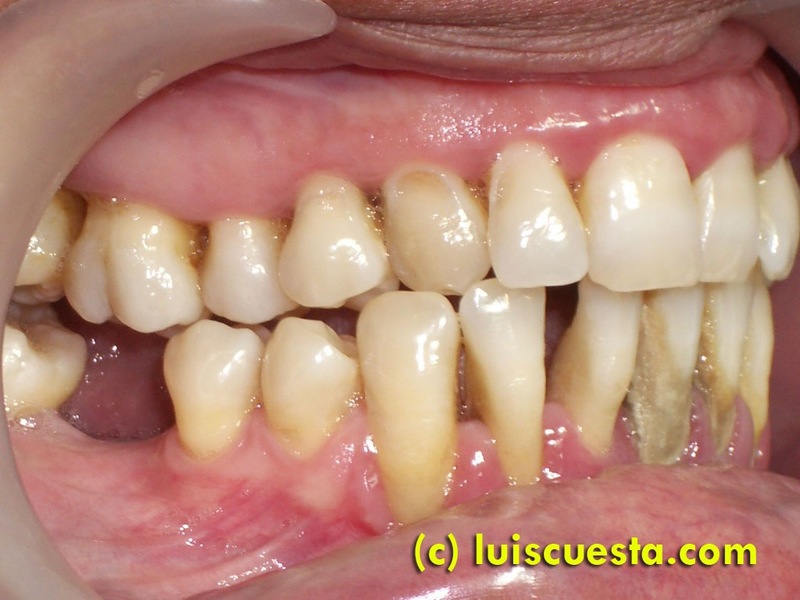 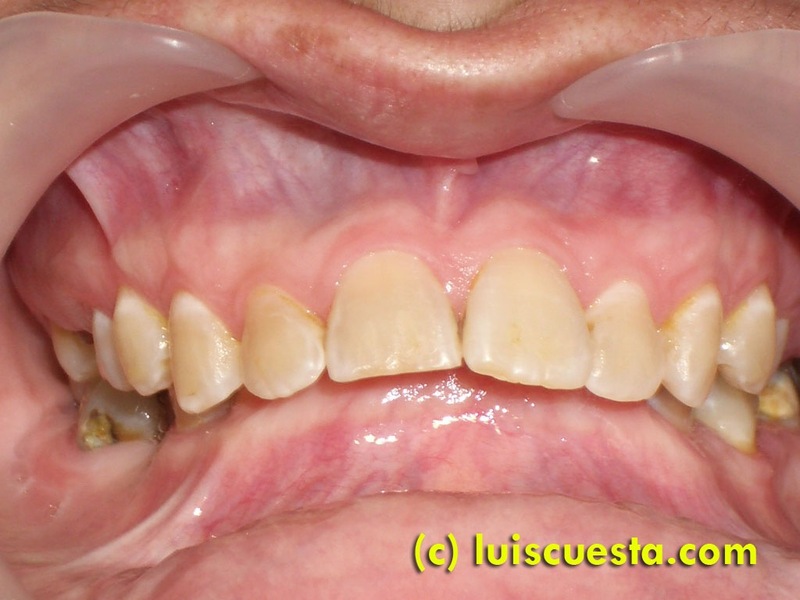 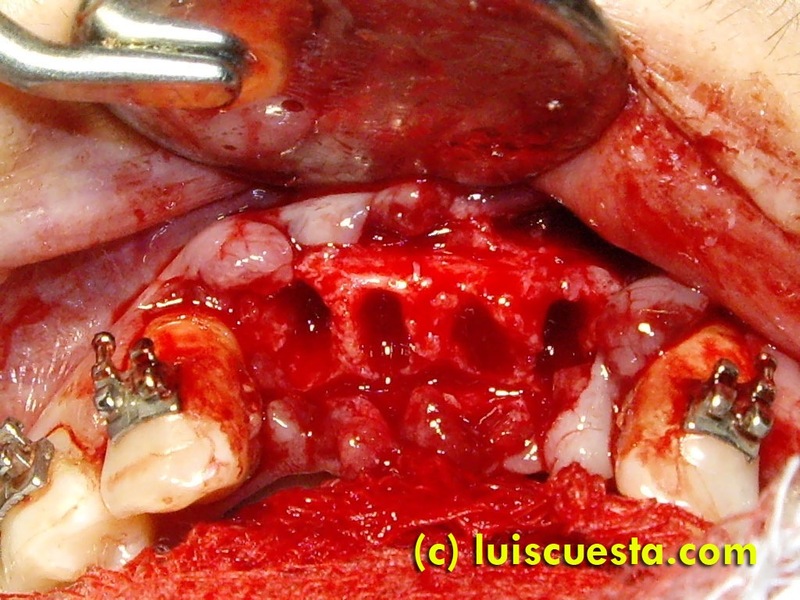 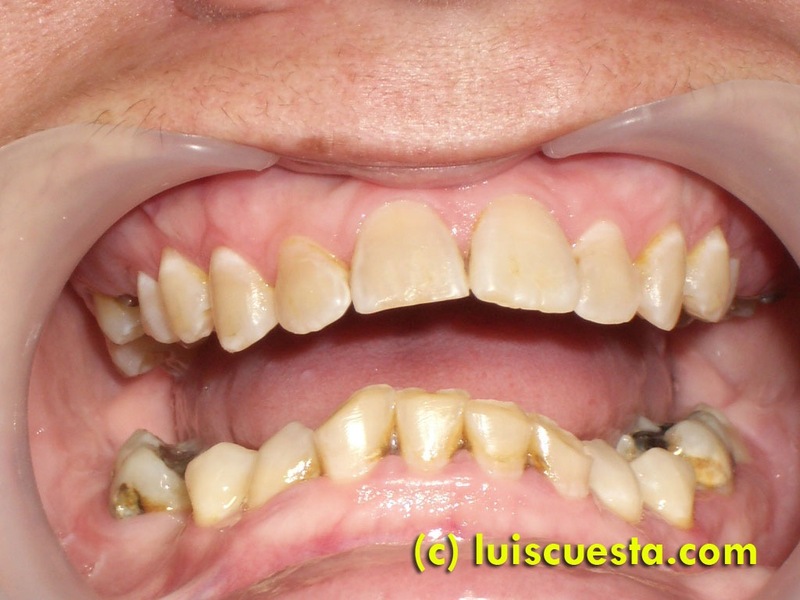 Extreme abrasion and deep Spee curve overbite that is damaging the palate gingiva behind the upper incisors. 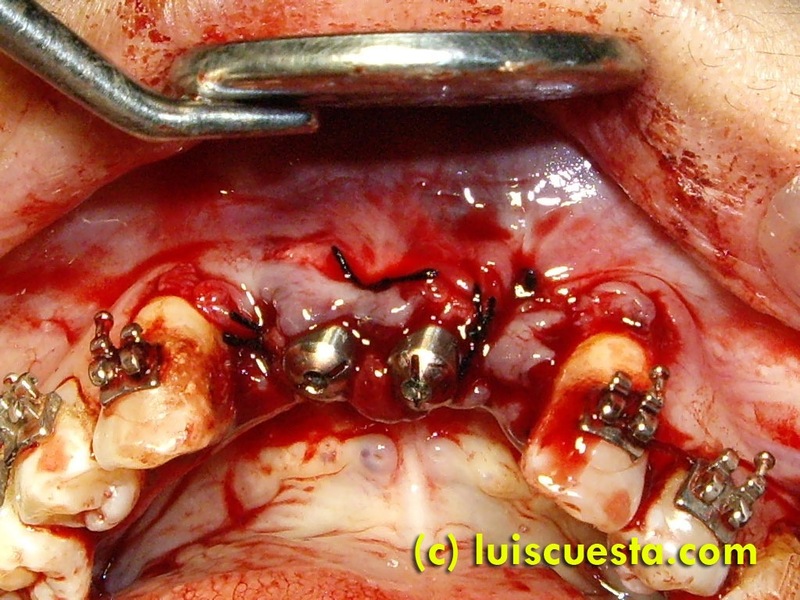 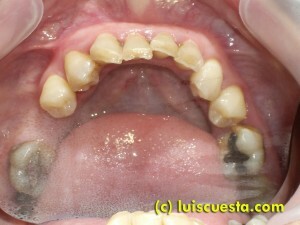 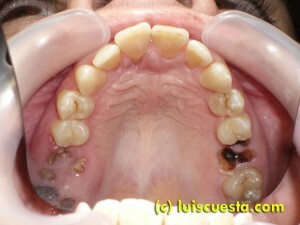 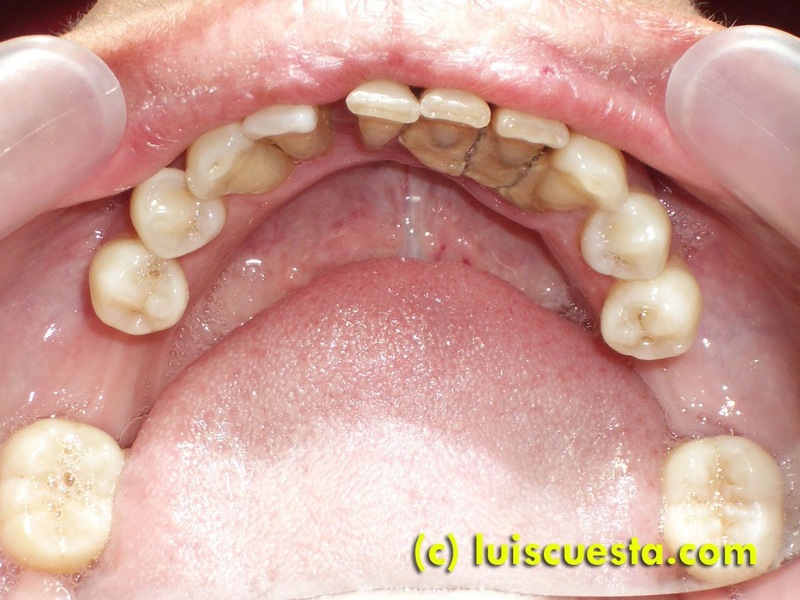 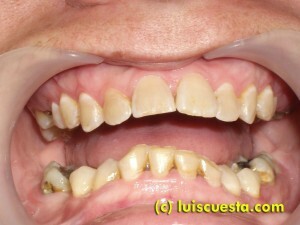 Lack of upper and lower molars that led to further bite collapse. 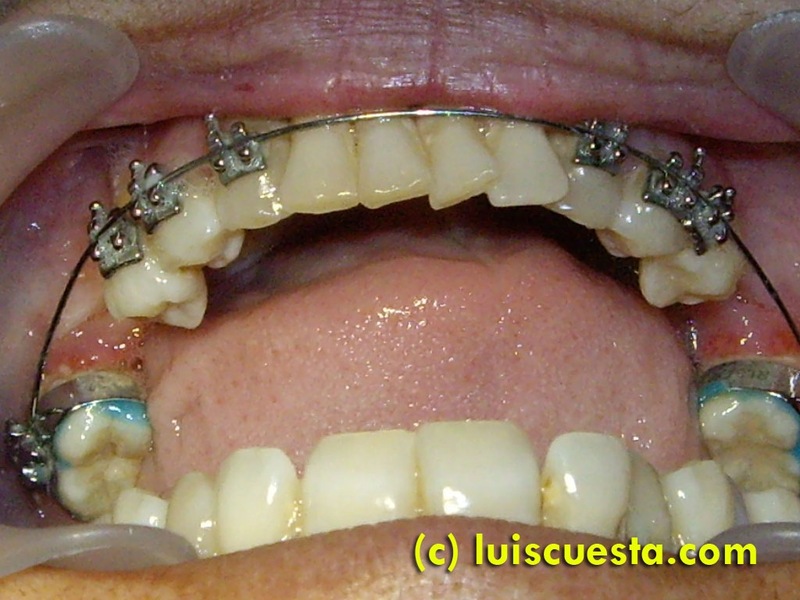 Due to the muscular strength, bone density and extreme degree of occlusal plane distortion, we discard orthodontics in the lower jaw. Rather, we go for a full makeover, full extractions and fixed prosthesis over implants. Nothing is easy in this particular case. 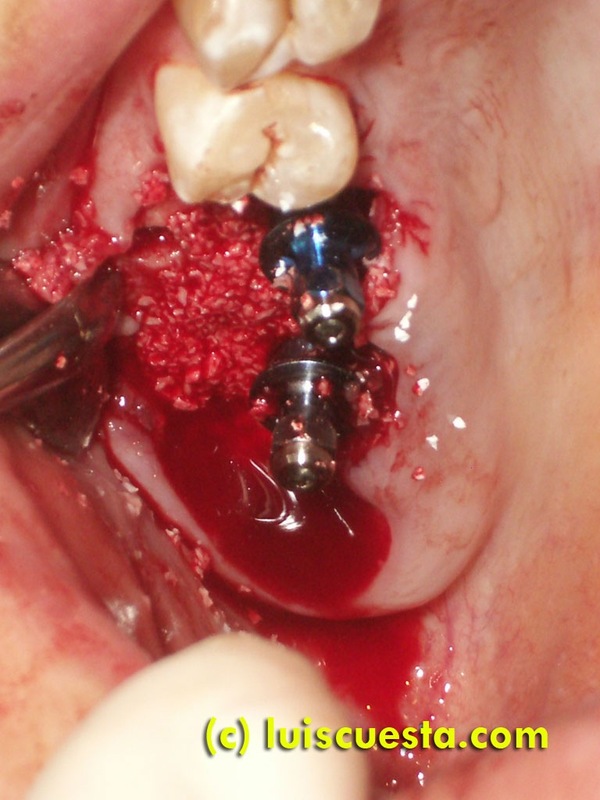 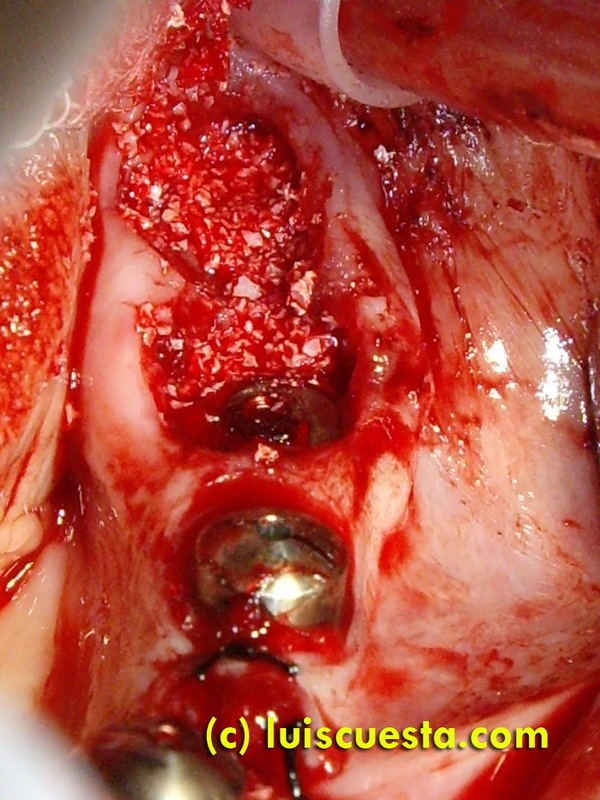 Decayed roots have plenty granulation tissue that leave wide open spaces after being removed and the sinus is a bit low as to place a short implant with this hyper-strong occlusion. Moreover, the patient is under anticoagulation treatment the we need to suspend. 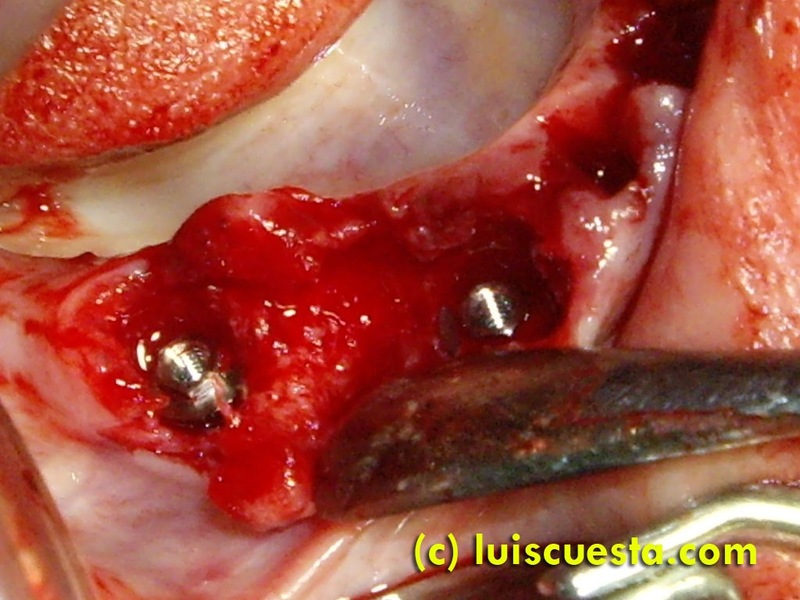 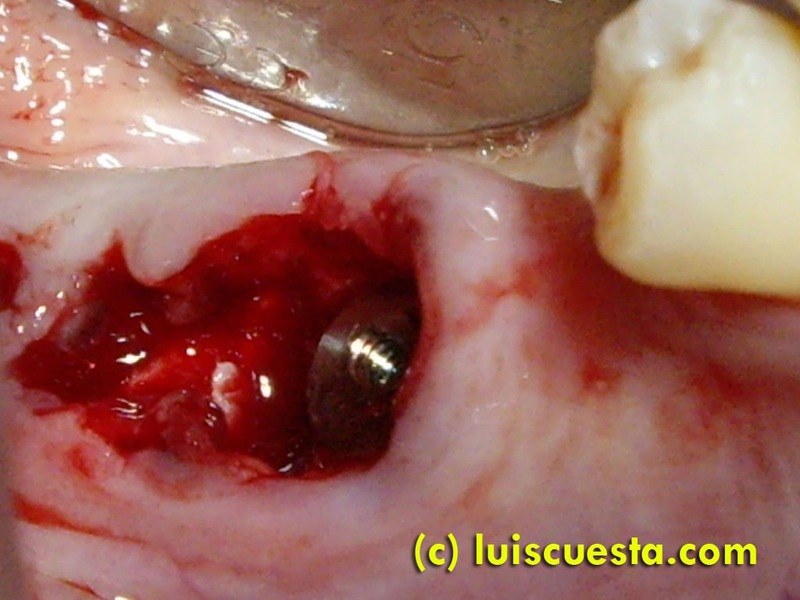 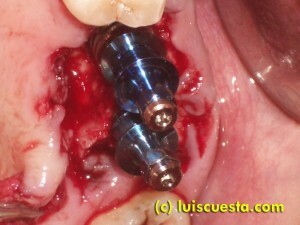 I would have preferred to approach the implant surgery after a period 3-4 moths after extractions, but the patient chose immediate implants, is possible, to minimize the number of surgeries and coagulation risks. 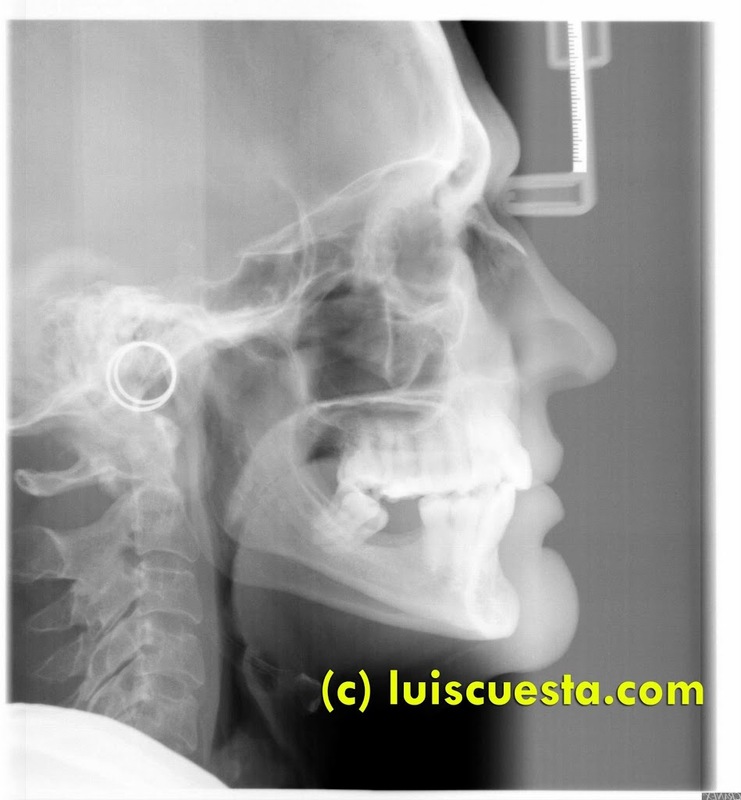 I accomplish the upper left surgery by lifting the sinus vertically with osteotoms, Bio-Oss bone graft and collagen sponges, leaving several threads non-screwed as to level up with the crestal bone. 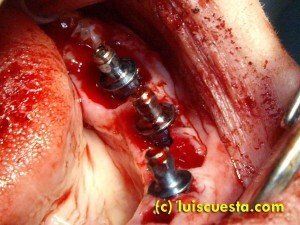 Then I fill up the gaps with Bio-Oss bone graft and cover it with a Bio-guide resorbable collagen membrane fixed by the healing screws. I stitch the flap back in place using gum portions for maximum closure and wait for second intention healing. Upper right surgery is accomplished two weeks later. A decayed root of molar 16 and molars 17-18 need extraction for periodontal reasons. 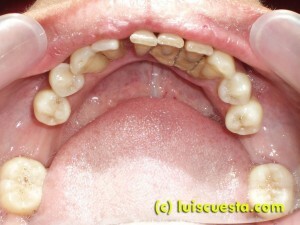 The steps are similar. 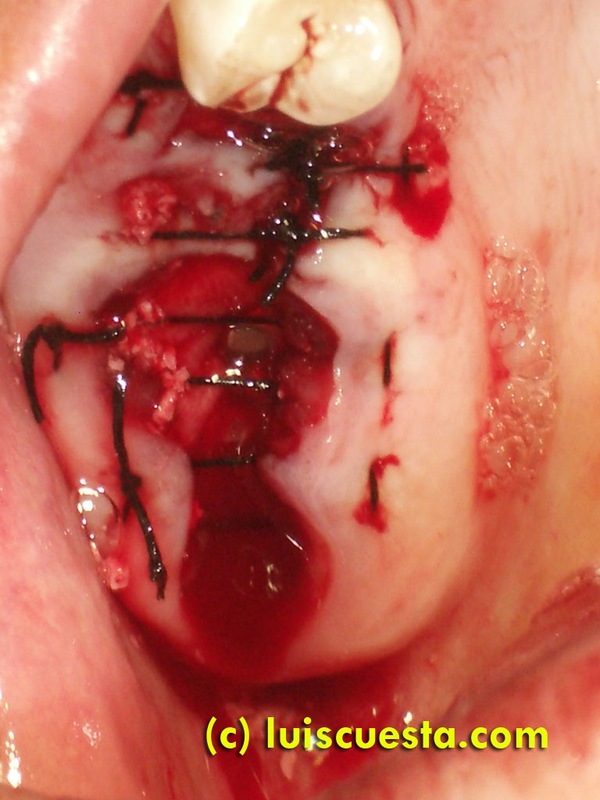 Vertical sinus lift with Bio-Oss bone graft and collagen sponges. 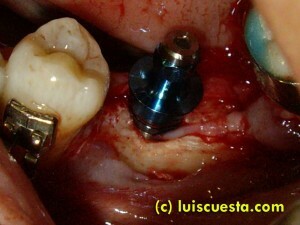 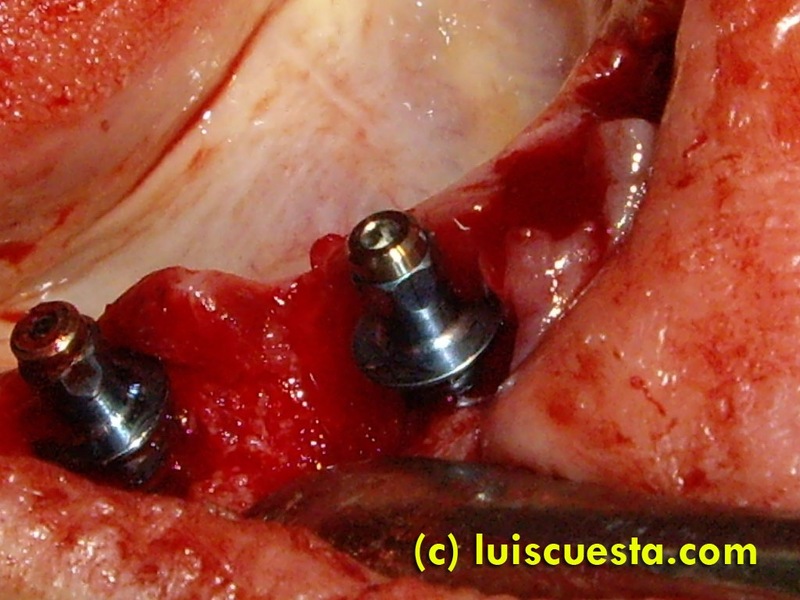 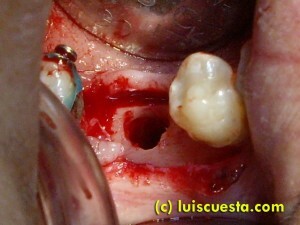 The alveolus is not so damaged, but I still use bone graft and membrane as on the left upper side. Panorex after upper upper surgeries. 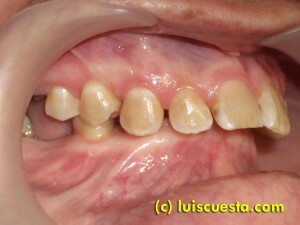 Two 5×15” on the right, 5×15” and 4×15” on the left. 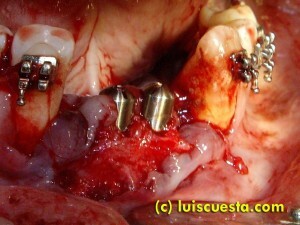 As for the lower surgery, we face the same problems. 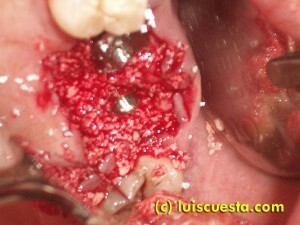 Wide alveolus, irregular ridge bone, plenty of granulation periodontal tissue. 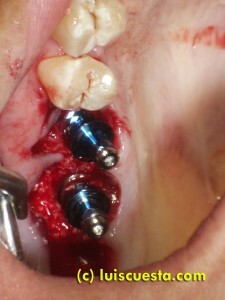 I extract the teeth, place implants as wide, long and parallel as possible using the alveolus as insertion guides. I place the implants a little under the crestal bone, providing margin for ridge resorption. 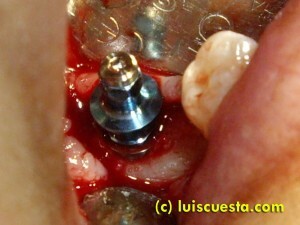 I cover the gaps with Bio-Oss bone graft and pieces of Bio-guide resorbable collagen membranes fixed by the healing screws. 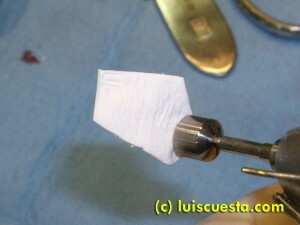 And I stitch the flaps back in please, using wide, second phase, healing screws for maximum closure. 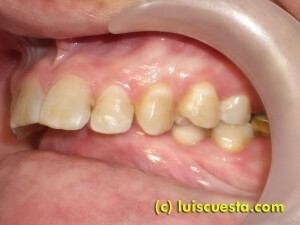 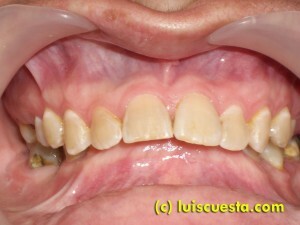 I prevent the patient from using the temporary denture as little as possible during the first weeks. 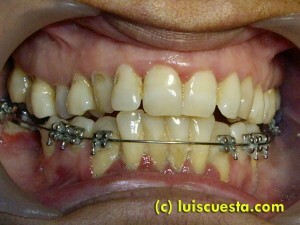 Her extreme bruxism might affect primary stability on any of the implants.